Wind: Light and variable changing directions occasionally. Time Aloft: More than four hours. 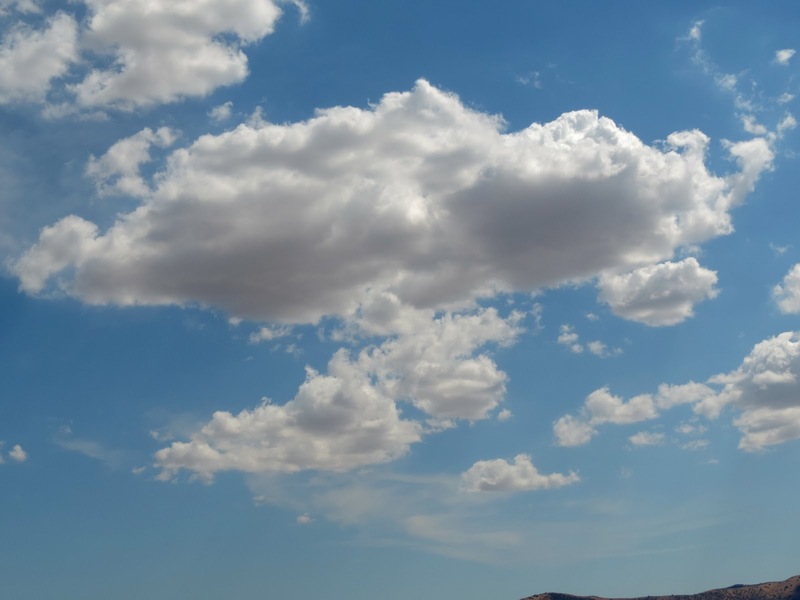 Comment: Lovely cloud markers up and down the Temblors. Big cumulus South and North. Tow pilot: Peter Mersino most of the day and again on Monday. With all the activity over the weekend, this blog is not following any reasonable time track because all the pictures and stories came in here in bunches. So during the time I had available until my first student, I took pictures with both Nikon's, one film, the other digital. Digital won, mostly. Framed by the soft leaves and puffy white clouds in the background. 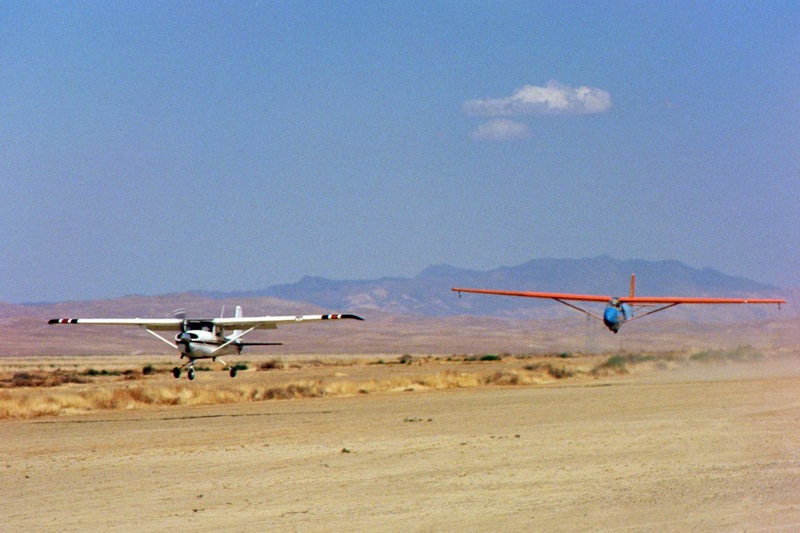 They look disconnected but actually the tow plane was towing the Orange Crush. Another nice landing on runway 13R. 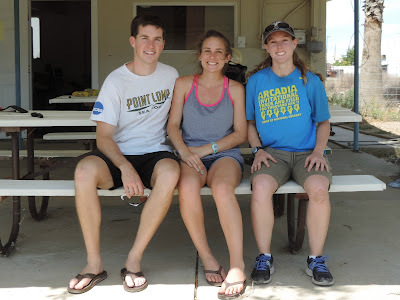 Andrea Mersino arrived in her Cherokee 140 along with friends from college, Sean and Ember Kinnally. 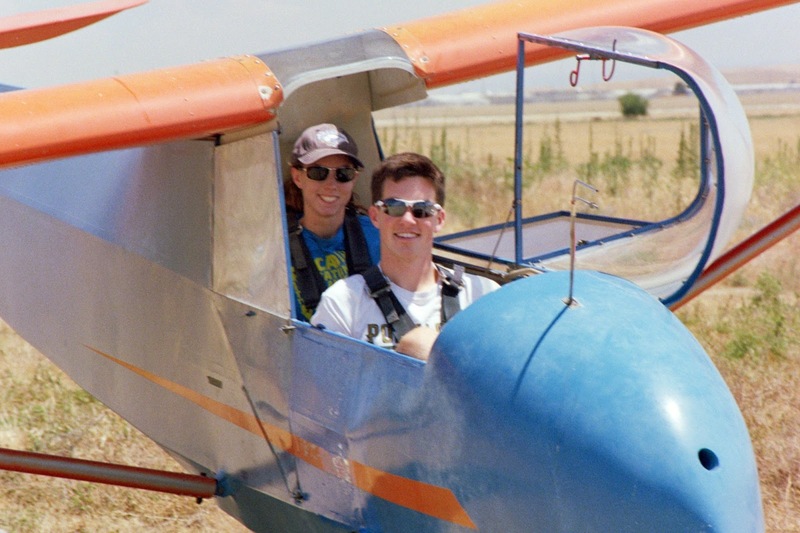 Neither had ever been in a glider and at first, they both begged off citing a need to get on the road. 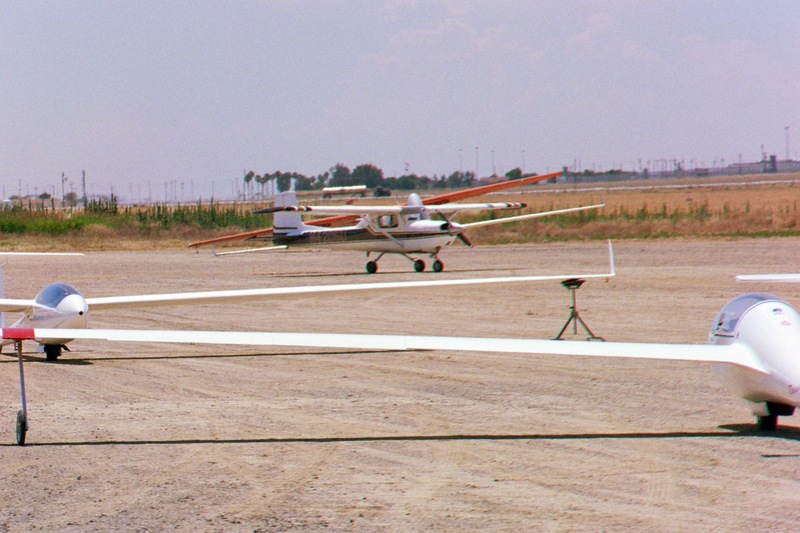 But Peter Mersino had other plans for them and convinced them both to at least try a short flight. So they did, and enjoyed the experience although I doubt there is a future glider pilot between them. Ember is ready, Andrea is having fun back there. OK, so Ember doesn't look too scared and worried about the bouncy air. 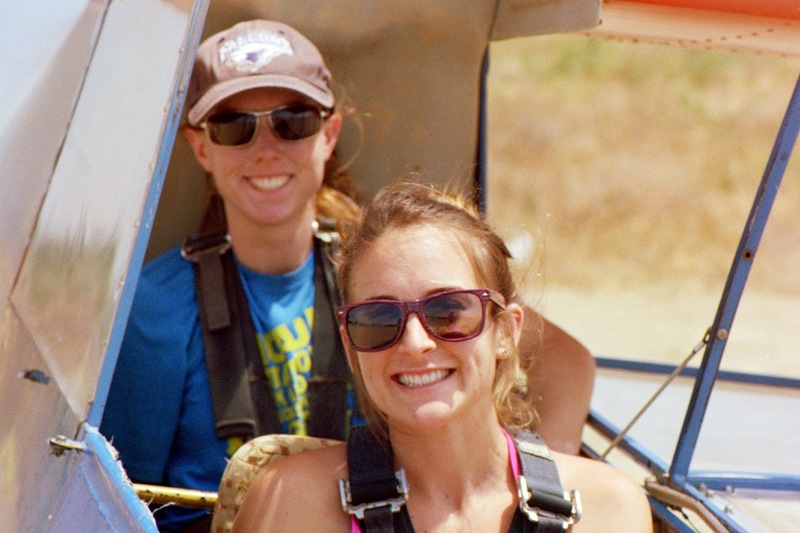 Ember and Andrea returning from what they both said was a fun flight with good thermals. Now it's Sean's turn and he looks calm so he might just enjoy the flight. Andrea points to his moral support. Yes, I think it helps to have his new (a few weeks ago) bride, Ember, give him moral support. 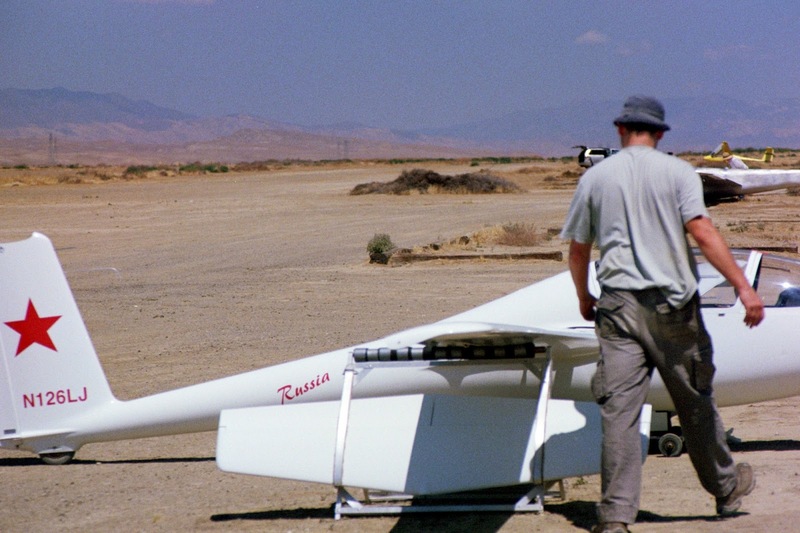 Now Sean's ready to face the great unknown, an aircraft without an engine. Now Sean and Ember Kinnally head off on their honeymoon in, yes, Hawaii. Before Andrea heads home, she helps launch Daniel Clark in the Crush. Dan on tow for a nice long flight although I don't know how high he went or how long he was aloft. Andrea flying Sean and Ember back to Fresno for their trip to Hawaii. 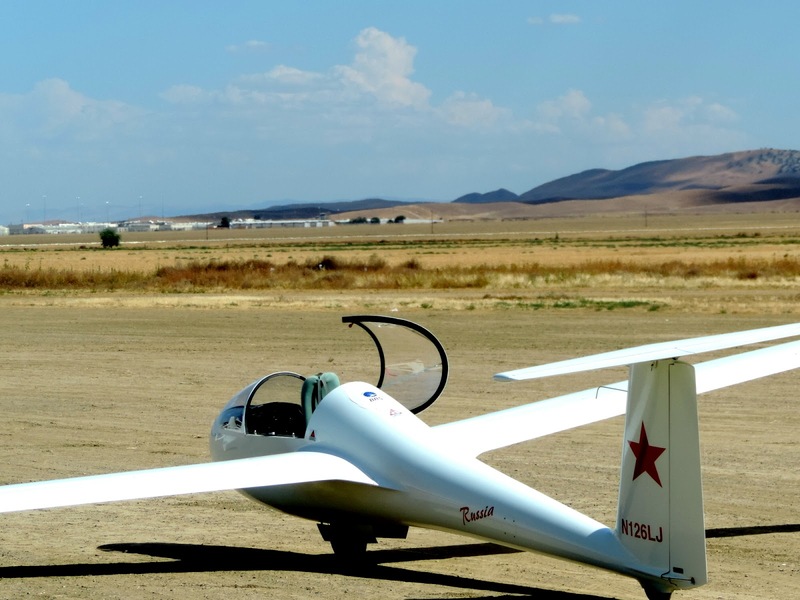 Early in the day, there was lots of activity among the high peformance sailplane pilots getting ready for what looks like a very good soaring day. In fact it was as the pictures and stories later on will tell. One flight in particular was Steve Valentine's. He and I got off tow and 2000 msl and hit a pretty good thermal. From there he did all the thermalling and managed to reach 5500 msl. a new record height for him and a new record time aloft of 1.2 hours. He was one happy student and will be back for more. 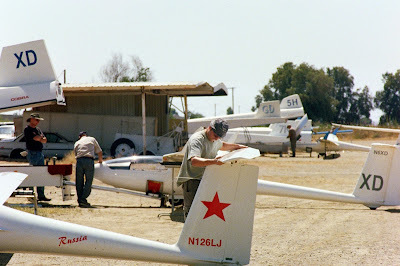 Here area few pictures of pilots assembling and getting ready to go. Everyone had their eyes on the developing cumulus both north and south. Lots of assembly activity along the trailer storage line. 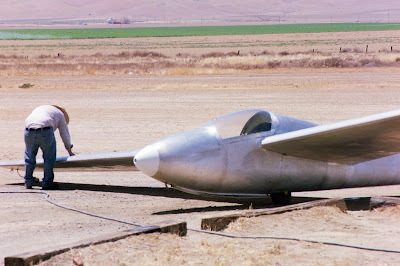 Mike Paoli washing the wings of the 1-26 in preparation for his flight. 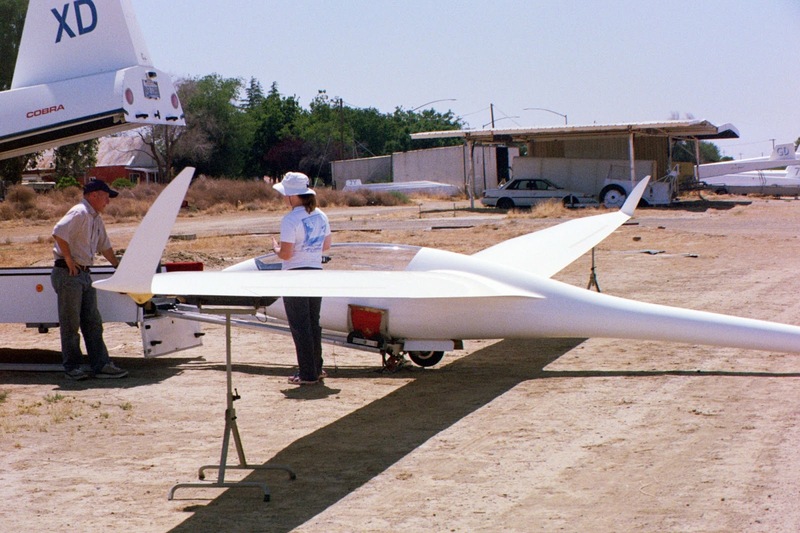 Bart Klusek, and Julie Butler, along with Dan Gudgel, and in the background, more gliders assembled. 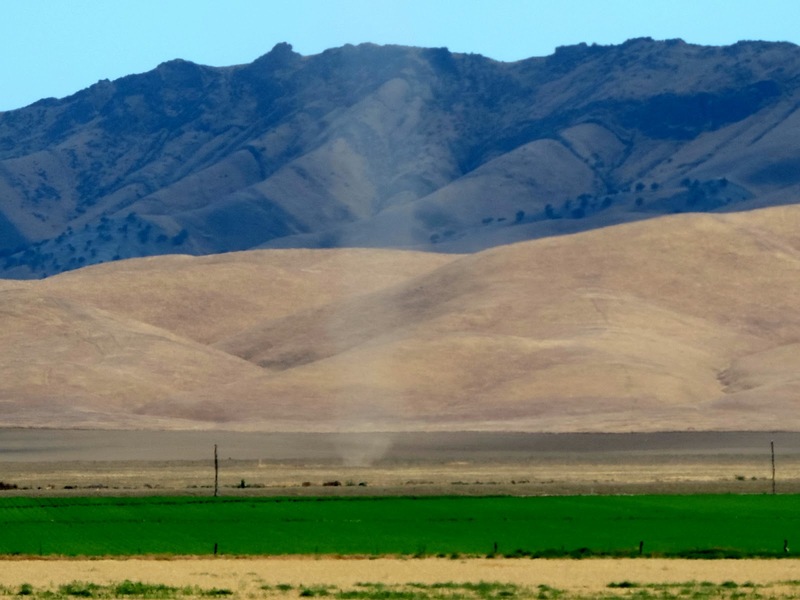 Just as a reminder of the day, a strong dust devil roared between XD and 5H moving right to left. The cu's kept building all day, but only near the end of the day did some areas experience over development. Out near the power lines, that area kept producing thermals in excess of 10 knots up. The day kept getting better and better all afternoon. Bart Klusek assembling the Russia, practicing it without any help. It's easy. Julie Butler getting a cockpit checkout from Dan Gudgel for her new Ventus A first flight. She understands and has read the manual. It's also not too far in operation from her previous DG100. Rick Eason departing on runway 13L after launching from the northwest end. Rick Eason concentrating on the tow, doing very well. At 3:40 pm the cu's were still strongly developing with concave bases as this one. I set three personal bests on Saturday: time aloft, maximum altitude (8,500 feet), and finally, finally, I made it to the Temblor and back. 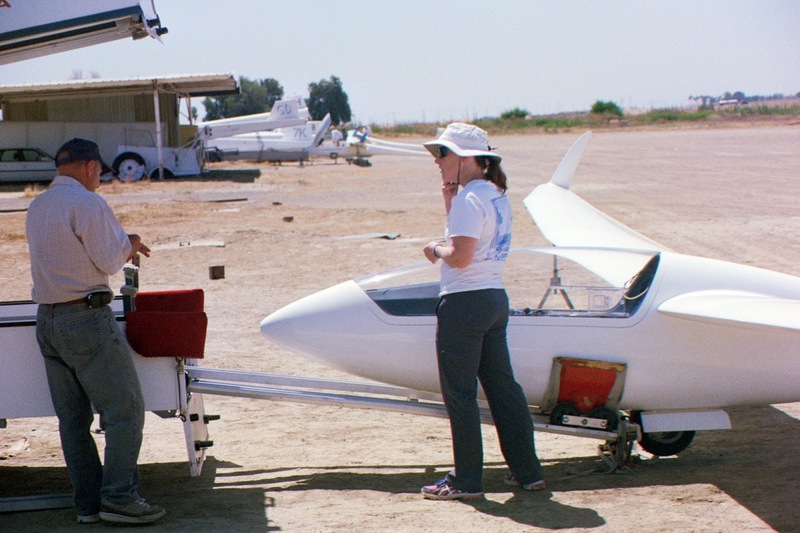 My success was attributable to a great tow in to sustained lift by Peter, remembering advice from Harold and Morgan on how to thermal, and the fact that I had washed the 1-26 (aka “Silver Bullet”), which, I’m sure, made this fun glider more slippery than ever. 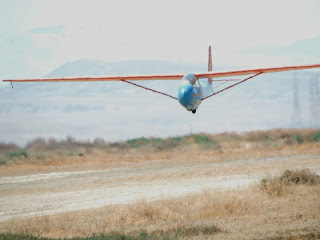 The fact that booming lift was available near our gliderport, the prison, and along the Temblor seemed to help as well. 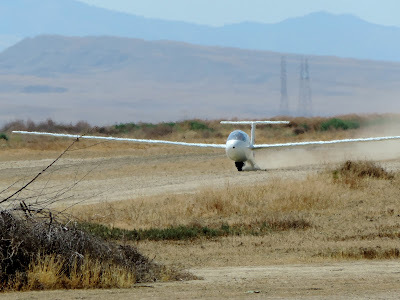 Later in the afternoon, while recovering from my flight at the clubhouse, Alex received a phone call from Pilot X, who had also set a new personal best by becoming the first pilot to land the 1-26 on Runway X (see attachment for location). 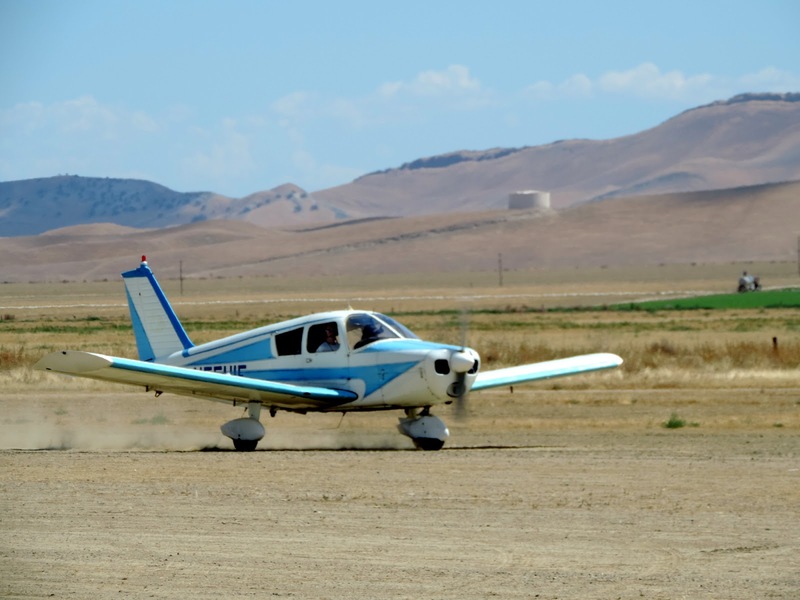 Pilot X made a perfect landing on the runway, which sometimes is a farm road, with no damage to himself or the 1-26. A recovery crew, consisting of Alex and myself, rushed (?) to the scene with high hopes that they could easily tow the 1-26 back to gliderport. 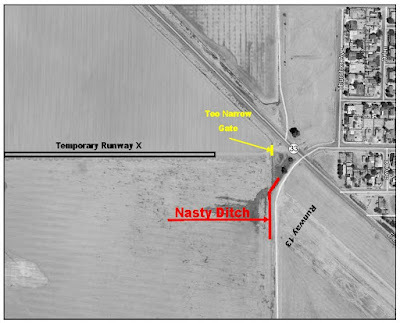 First, however, the crew listened to Pilot X’s explanations for why he used the new runway instead of Runway 13, the most interesting of which was the previous pilot has used up all of the lift. The crew then carefully evaluated and ultimately rejected the idea of trying to squeeze the 1-26, with a wingspan of 40 feet, through the gate at the end of the runway/farm road, with a width of 15 feet. Finally, the crew made the decision to remove the wings. 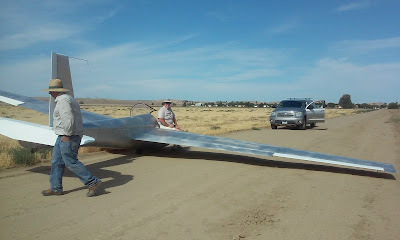 Under Alex’s supervision and with Alex and Jim doing the heavy lifting, the team completed the wing-removal process, moved all of the parts to the airport, and reassembled the 1-26. To recover from the recovery process, the team joined Morgan, Julie, and Andy at the “Burrito Place,” where we learned that Andy had a great flight on his birthday with Morgan. Overall, Saturday was a great day for me, not only because of my flight in the 1-26, but, more significantly, because of the camaraderie I enjoyed throughout the day with my fellow pilots. 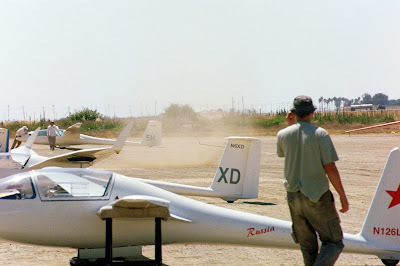 Bart Klusek landing after a nice flight in the Russia. Moving to put the Russia back in the box. Jim Rickey got a late start, 3:50 pm, in the 1-26 but the skies showed cumulus still building. Dust devil forming just as Jim Rickey launched. Late in the day we wondered if those pilots who flew south were going to get back. 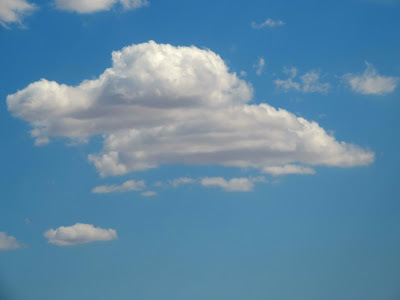 The rising cumulus tells a story. 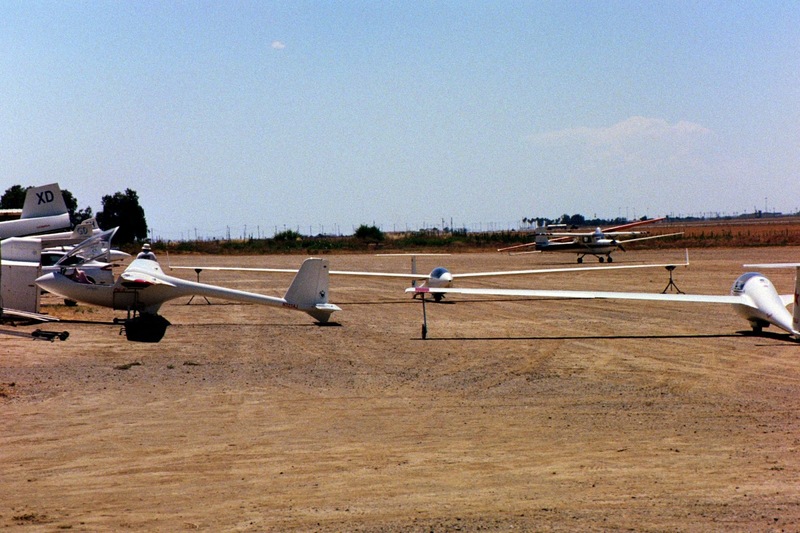 Had the glider starting at 3:45. Looked at my watch as the rope was being hooked to the tow plane, and it was 3:42. Something is going right. Before takeoff I had listened to the earlier pilots talk about where they found lift. Noted several comments about the light area northwest of the circle crop, just this side of the power lines. 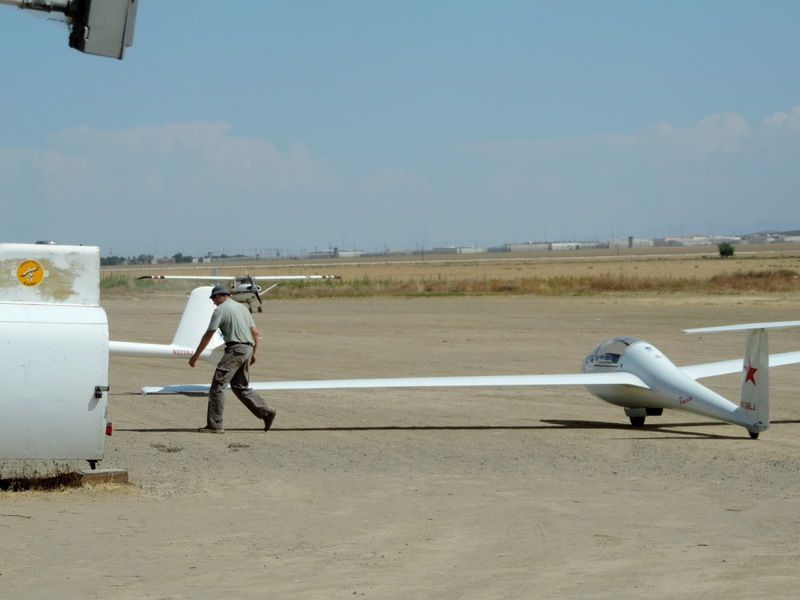 Mike Paoli was the latest to come back, and he reported 6600 or 6700, msl. That is where Peter took me, and finding a bit of lift, I released at about 2000 agl, (2800 msl). Worked it up to about 3300 msl. Searched the area, but just could not find enough lift to make it worthwhile. Should have been a clue to me that lift was dying. At that point I had a decision to make. Be content to just hang around there until I got bored and went home, or go for those promising looking CUs to the southwest. I could easily make it back to the gliderport at that point, but the voices of the XC-Clinic said, go for it. I would go no further than I could make it back to my present position with altitude to spare. The CUs did get me a little bit of lift, to maybe 3700. But it was getting harder and harder to find lift there. Was getting a little uncomfortable with my position and distance to the gliderport, so I headed back to the area I had gotten up to 3300. Lots of sink enroute--got there at 1800. Nothing. Not even a little bump. Up or down. Forge ahead. At that point even a straight-in to runway 7 would require a little bit of assistance from the atmosphere. 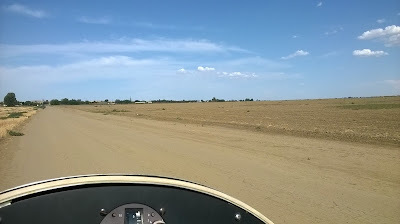 The dark brown field, the second field east of the circle crop, and the second field west of approach end of runway 7, that has been so dependable down low right after takeoff, was within reach. But if it did not produce, the whole route between present position, that field, and Runway 7 had more obstacles. So I discarded that option. Several times I had eyed the east-west road just touching the northwest corner of the gliderport. A certain land-out on that road seemed like a much better option than a chance of making it ?home? over more hostile terrain. Surprisingly smooth ride down. Passed a crew working on the field. I could see them looking at me go by, then they went back to their business. Saw a couple of pipes sticking up a few feet north of the road, so I stayed slightly south of the road until those were cleared. Had a good half mile of clear road. Landed without incident. The whole event seemed surprisingly routine and a non-event. 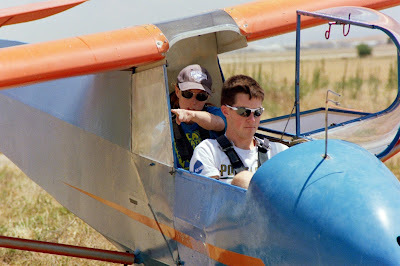 Once it was apparent I likely could not make it back to the gliderport, I went for the safe, sure thing. Not a scratch, bruise, or scrape was put on the 1-26 or myself. Inconvenient, yes, but otherwise, no big deal. During disassembly, I did look to the area of the CUs, and virga was falling. West of Coalinga it looked like it was pouring. Guess I started too late. 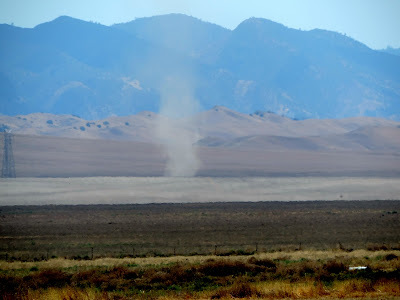 As we were carrying the wings through the fence, I looked in the light area to the northwest, one massive dust devil, followed by a smaller one. Where were you when I needed you?? 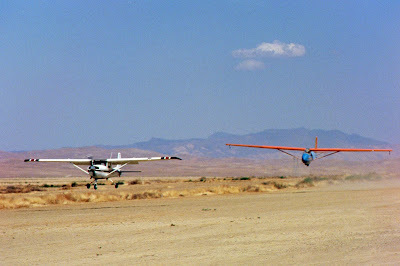 A few minutes later when we were reassembling the 1-26, along comes Orange Crush on final approach. He had taken off about a half-hour before me, and finished about an hour after me. And got back to the gliderport! Good job! At the taqueria afterwards I took some good-natured kidding. It was surprising how happy everybody was that I joined the landout club. We are a bunch of deranged people. (In the best sense!) All the previous landouts this year are out of contention for the Tape Measure Award. Somebody can still sweep it away from me, but if you’re not careful you will actually end up back on the gliderport. Mike Paoli made a graphic of where Jim Rickey landed in the 1-26. Jim still sitting in the cockpit after landing in the farmer's field. When Morgan saw this picture he asked how anyone could land-out with a sky like that. Mike Paoli and Jim Rickey try to figure out how to get the 1-26 back on the field. I guess that's the best place to do some real thinking. If you like these pictures thank Alex Caldwell and his finger tips. We had a lot of fun with Jim Rickey's land out on Saturday. 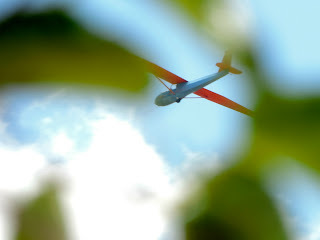 I'll let him tell about the flight and the actual landing, but I thought I'd tell about the retrieve and forward some pictures. Just as we were starting to secure the clubhouse late in the day after putting the tow plane away, I got a cell phone call from Jim Rickey. 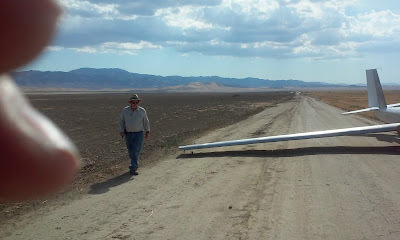 He said he had landed out in the 1-26, and was just off the departure end of runway 31 to the north west of the airport. Mike Paoli and I headed out in Mike's Suburban with a tow line, to accomplish the retrieve. Jim did an excellent job picking his landing spot. He landed on the long road that extends true West from the gate just past our property in the next field along Highway 33. It's the road that's along the edge of the same field that Julie landed in when it was soggy from growing carrots a couple of years ago. It's generally a good idea to be very cautious about landing on roads. 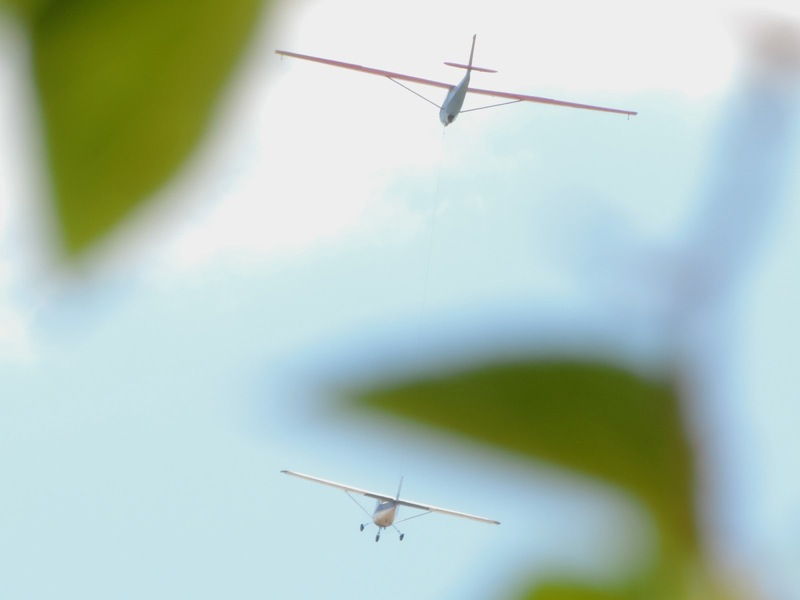 Besides cars or other vehicles, there can be a lot of hazards and obstructions along the roadsides your wings can hit and are difficult or even impossible to see from the air until you are committed and it's too late to avoid them. But, I must say that in this case, Jim picked a very good road with absolutely no hazards of any kind. 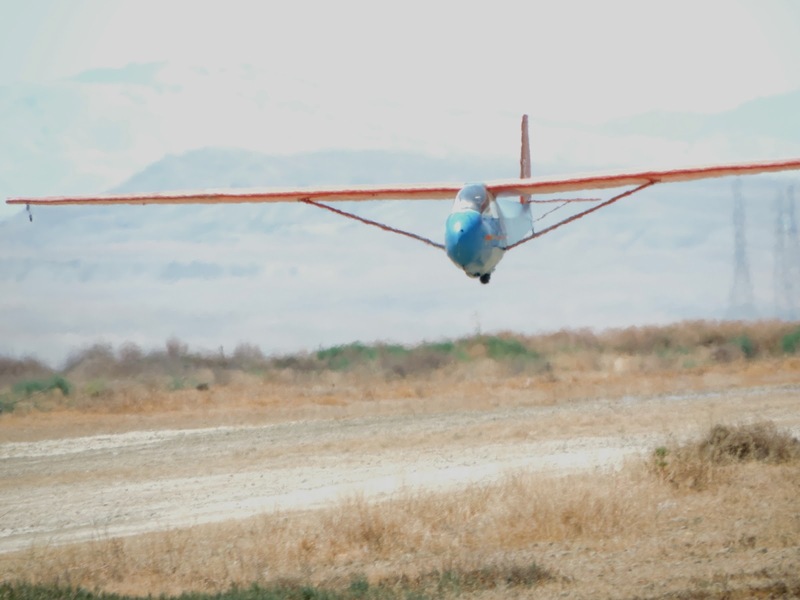 He landed towards the East, which is the uphill direction, which was a very good move and was also more into the wind as well. On the phone, Jim thought we'd probably be able to tow the glider back to the gliderport by car with a rope. We have been able to get the 2-33s through the gate on highway 33 at the East end of the dirt road before. It does involve some fancy maneuvers turning the fuselage while lifting first one wing and then the other to clear the gate posts. However when we got the 1-26 up near the gate, it became apparent that with 3 of us, there was not going to be a way to get it through that gate with its low wings. 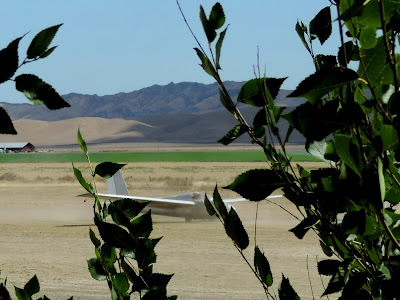 We thought of possibly putting some timbers over the ditch at the end of runway 31 that we might be able to drive and tow the glider over, but the ditch is actually 2 adjacent parallel ditches, and they are quite deep with soft berms. The timbers we were looking at near the clubhouse also were too short and very heavy, and it would have taken many, so we quickly gave up on that idea. 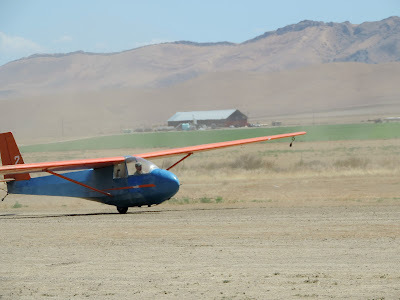 We also drove out by Loyal's old house, where there is another gate, but it would have required a long tow over soft dirt to get the glider to that location and there was only a quite narrow gate there as well. The other option might have been to take down a few barbed wire fence stakes near Loyal's old house or somewhere else along that road/runway. 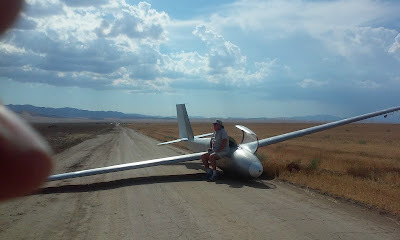 Another thought that briefly went through our heads was to do an auto tow launch of the glider along the road where Jim landed and fly the glider back. But the wind was mostly out of the North and almost a 90 deg. cross wind. Having never launched out there that way, it not being our property, as well as the fact that we had kids on bicycles and a 2 or 3 cars driving out the road to see what was happening, along with some workers driving back from a field to the West quickly nixed the auto tow launch idea. 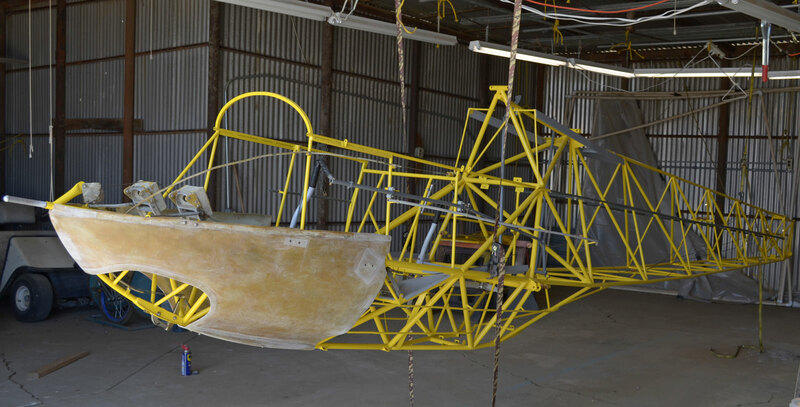 We decided the best thing was to just remove the wings, bring the parts through the gate and reassemble the glider back on our property. Which is what we did, after bringing my van out to the land out site with a few basic tools. 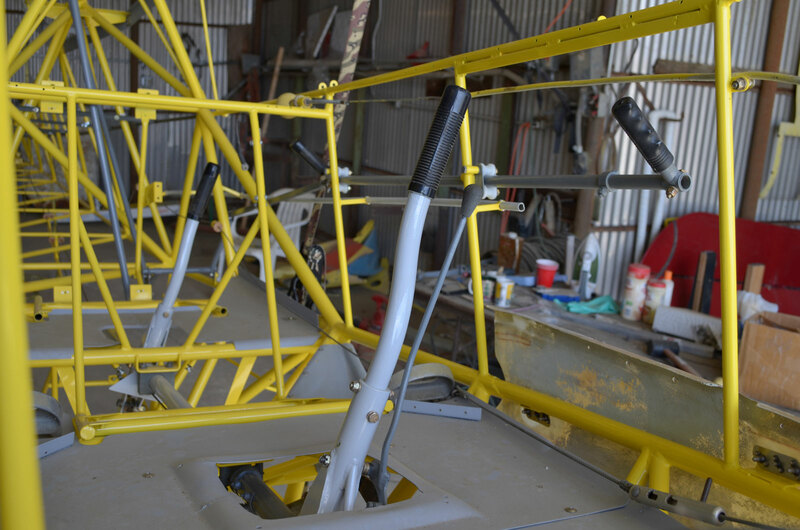 If you have to disassemble the 1-26, you'll need a ratchet with 9/16 socket for the main wing spar bolts and 1/2 in socket for the drag spar bolts. 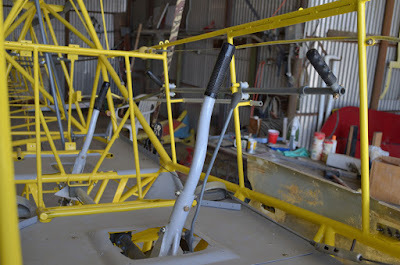 Also a "wing stand" such as a saw horse and some cushions to lay the root ends of the wings on. The tip ends will clear the ground using the normal wing wheels for support. 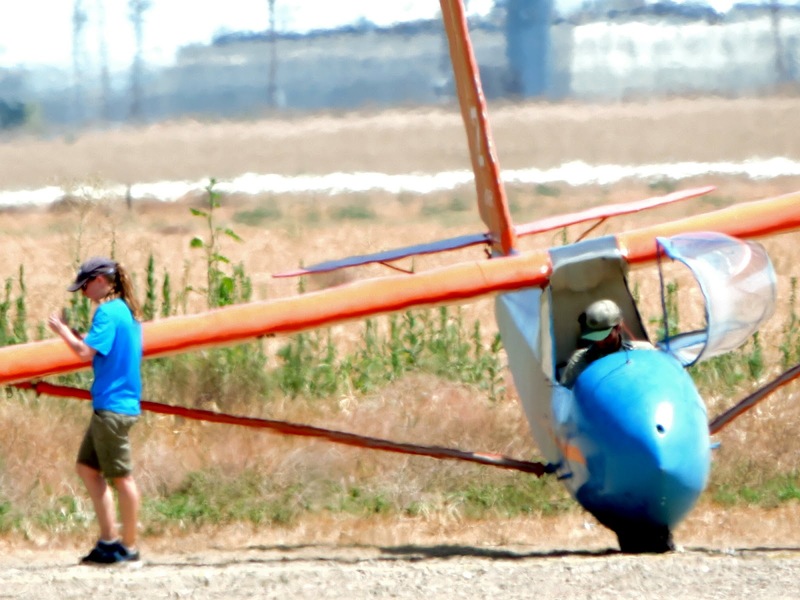 Just as we were finishing the reassembly at the departure end of runway 31, first Dan Clark in the Orange Crush and Morgan and Andy Reistetter in the Duo landed. They saw our plight and all came out to help finish the job along with Julie. Afterwards, we all adjourned to the Taqueria and had a great dinner before departing on our separate ways. It was Andy's birthday and after his fantastic flight with Morgan, he treated us all to our favorite Mexican dish! So, the story ends at the Taqueria with all having fun telling war stories that over time will get better and more exciting. But is that the end of the story? No, Jim Rickey got "back on the horse" and flew the next day. 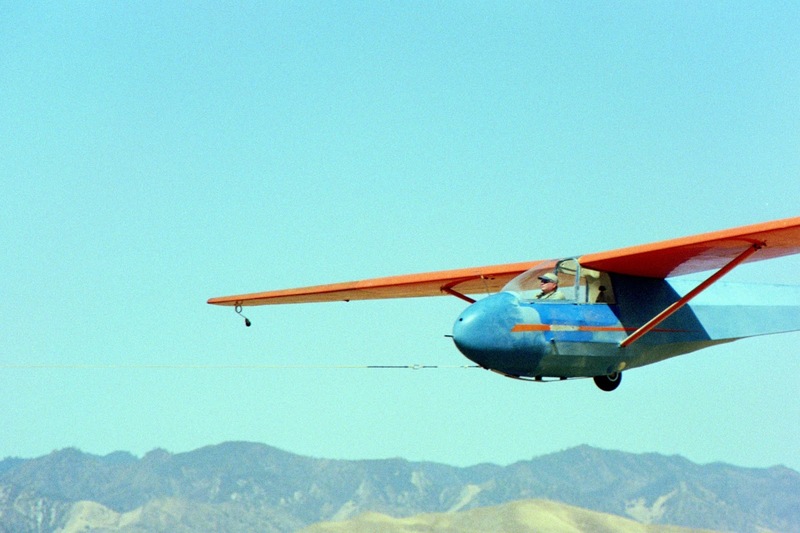 In a story of significant understatement, he tells of a flight that bested any altitude he's ever been at. Here is his story and look at the altimeter in the photo he provided. Yes, that's right, 11,580 msl. Did better getting lift Monday--no landout. It was almost a short flight. 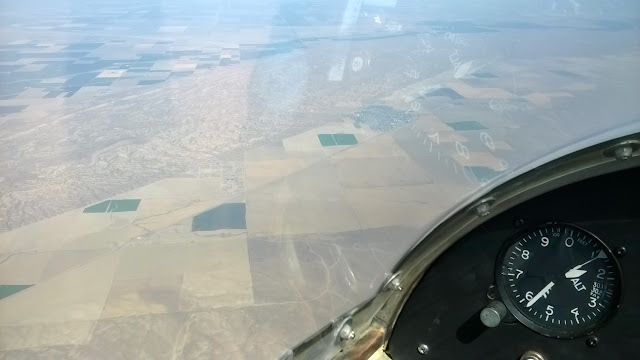 Was getting nowhere after release, and heading back to land when I thought I would give a try with the dark brown field (under the reflection of the altimeter digit "8"). Gave me a 3000' rise, so then I could play. Lots of up and down, this picture was taken near the highest portion of the flight. Temperature: I did get a preflight briefing, and I did look at the forecast temperatures aloft. Noted the forecast for 12,000, and thought, 'I had better take a sweatshirt.' Then I thought, under that bubble canopy it won't be necessary. 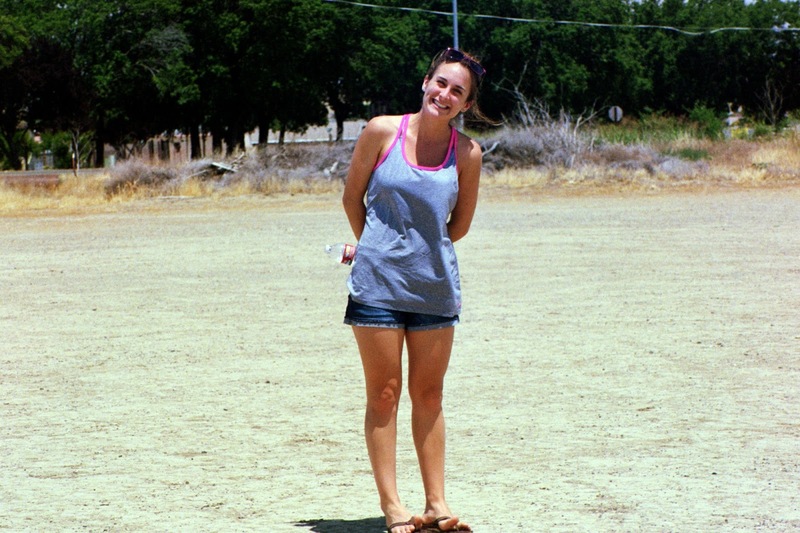 I had on shorts and the Soar Avenal long-sleeve 2014 contest shirt, my usual heavy-duty hat, and a heavy layer of sunscreen. I would describe the temperature mostly as, "A pleasant cool." After a while it was getting cooler than pleasant, and I thought about closing the vent, but I decided to enjoy the cold while I could. Oxygen: Above 12,500 for more than 30 minutes and supplemental oxygen is required. It is required at all times above 14,000. Altitude: I would have liked to gotten above 12,500, for the heck of it, but the climb was getting slow. Don't know if it even would have been possible without heading to the CUs a few miles in the wrong direction. It was getting time to head down so any retrieve crew that may have landed prior would not be waiting around too long. Radio: Speaking of retrieve crew, received audio was horrid. If I had been able to contact either Jan or Richard I would have told them I was in great position, and they could head home. I thought about transmitting in the blind, but received audio was so bad I would not know if I got one of them, or somebody from another planet with a mouth full of mud. After Big Bird is flying again, I would like to check the installation to see if things can be improved. Then I heard that on Tuesday, Jan Zanutto reached something like 12,500 msl. I must have deleted that email so I can't be sure but he can let us know the exact altitude when he reads this. Morgan's Flight Report Task: As far southeast as reasonable and then back. Got a later start than desired as is my norm. Conditions were strong right off tow with a climb to 6k under a developing cu. Then moved under Karl Kunz nearby hoping to get some of his 8kts of lift. That never materialized, but when Karl headed out from 8k, I followed him towards the mountains. We connected with a good climb near the power lines. Taking that to over 8k while Karl pressed on towards Orchard and cu that kept dissipating in front of him forcing him to work back up from 4k or so in Sunflower Valley. I turned and headed more easterly along China Ridge towards Paramount. That line worked well and it only took us one additional thermal about half way to Paramount to give us the legs to run all the way into the north end of the Temblors . Once connected on the Temblors a good climb got us back to cloud-base for another 30 mile run without circling. I pushed farther along the Temblors than ideal, but I was hoping for the development of a direct line to Mt. Pinos. Instead, the gaps between the clouds seemed to widen and cloud-base lowered a bit. Leaving the Temblors for Caliente Peak. This is one of my favorite areas. Note the San Andreas fault and the creeks that shift where they enter and where the exit the fault line. This forced us off our course line and over to Caliente Peak in eastern San Luis Obispo for a solid climb. 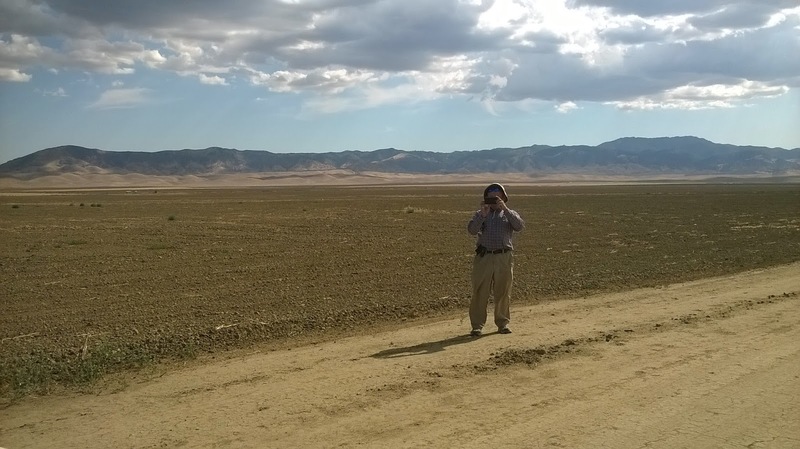 That took us across the Cuyama Valley and over the New Cuyama Airport that has freshly painted numbers on the runway and did not appear to be blocked with vehicles any longer. Near Santa Barbara canyon we connected with another climb to over 10k and were able to turn east again. 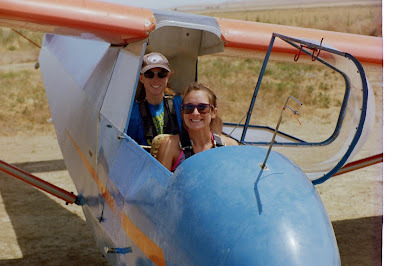 Running along my old hang gliding grounds near Pine Mountain in the Sespe mountains we touched 11k at times. Nice when back in country like eastern Santa Barbara county. 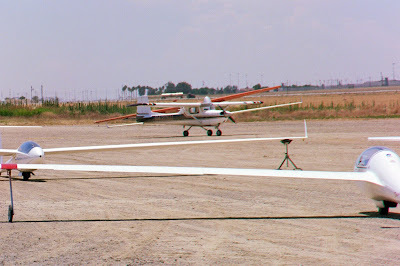 I think Andy was amazed that our best airport option was Santa Paula or Oxnard at that point. 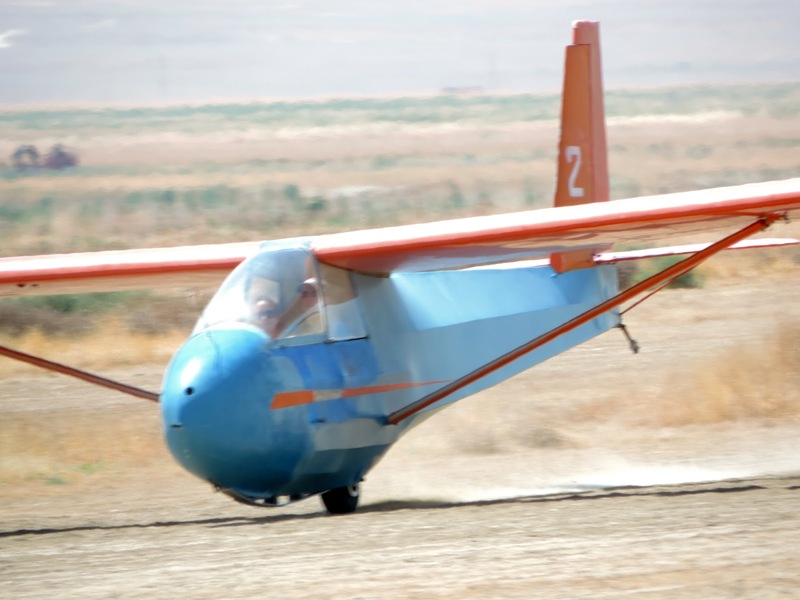 No reason to go there, but always fun to point out the ludicrous reach of a high performance glider. Looking South towards Santa Paula and Oxnard from over Hwy 33 near Pine Mountain. Convergence shelf cloud. The line bent north from Reyes Peak to Mt. Pinos and then east again to Frasier mountain. Probably could have just jumped the gap directly, but if there is an obvious line of clouds I usually follow it. Turning north from Reyes Peak towards Mt. Pinos. A strong climb at Frasier and we headed east towards Pyramid Lake where cloudbase was at least 1000ft lower. 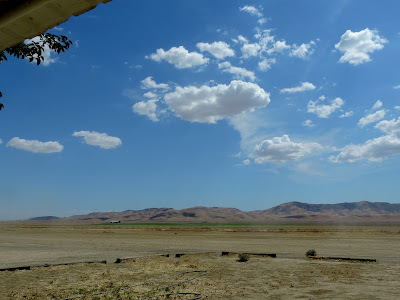 We crossed I-5, jogging a bit more northerly again to a line of clouds on the hills on the south side of the Antelope Valley at the western edge of the Mojave Desert. Those clouds worked well and we pushed east, taking a couple decent climbs. We ran out of clouds a few miles past the Lake Hughes VOR. The line turned north out into the desert and straight into a massive cumulonimbus that was dumping rain and lightning on Mojave. No need to go exploring that! We turned around and started home. We had left Frasier Mountain at 11k. 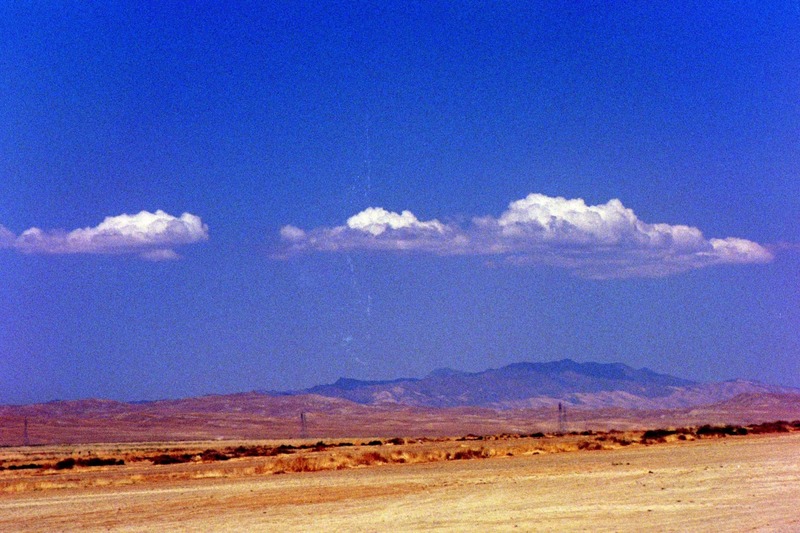 Cloud-base in the Mojave was 9k and the top of Frasier is 8k. The line we had come east on was looking very dark and sketchy, but there were nice looking cu on the north side of Pinos if we needed to skirt the main line for fear of overdevelopment. We found a good line direct to Frasier, but couldn't clear the mountain when the cloud in the lee didn't work. We skirted to the north side where there was some bubbly, but unproductive air. It took about 10 minutes to finally get around the corner and established with a good climb. Then it was back to the races under the dark cloud street and getting away from some overdevelopment on the Sespes. We briefly thermalled with BB near the Cuyama River and Ventacopa. He and WX had done the "Death Dive" from Tehachapi down into the SJV towards Delano. They worked their way across the valley and eventually connected with the good air in the Cuyama Valley and made it home. We hit another slow spot near Caliente Peak. I had taken a direct line there to beautiful looking clouds, but they weren't producing well. 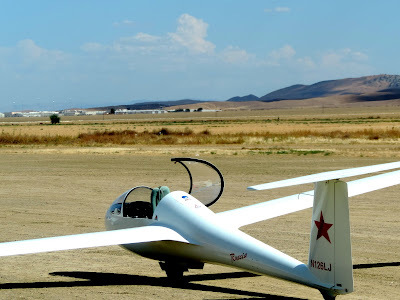 Wasted a few minutes churning around in broken lift before connecting again with a good climb to cloudbase and our final thermal about 70 miles out from Avenal. From there it was a typical convergence run home, s-turning in strong lift while keeping forward progress going. 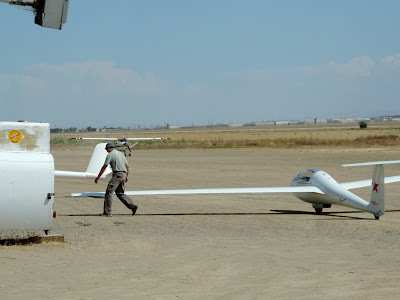 We were able to start final glide from about 45 miles out, despite 10-15kt headwinds. A good energy line across the 41/46 pass let us keep going as Andy finally got a chance to practice his convergence flying techniques after I hogged the controls most of the flight. 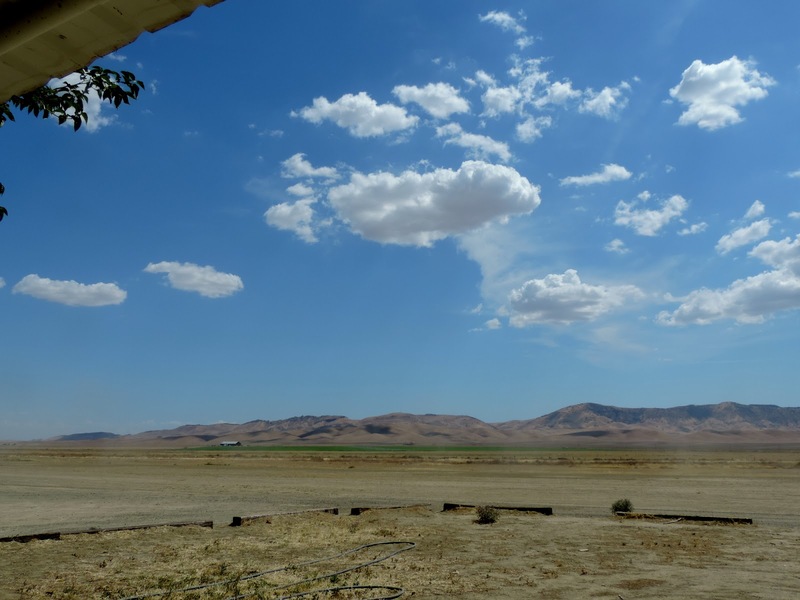 We pressed on, up towards overdevelopment in the Priest Valley area before heading out towards Coalinga and a straight dash back to the airport. 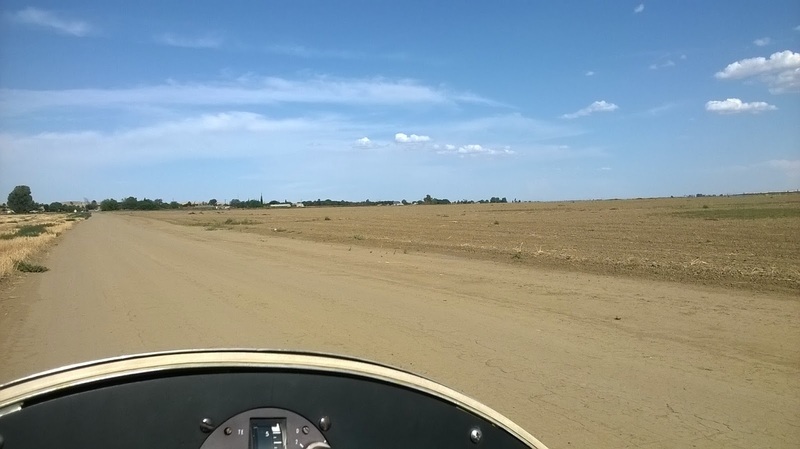 All total it was a 550km flight on the OLC at 105kph average. Max height of around 11k and no real stressful or low moments to be had. Andy didn't have much difficulty adapting from his Russia. It sure looked a lot nastier in person. OD in Priest Valley. Great burritos, tacos and barbecued chicken at Los Primos Market across from the hardware store with lots of friends. Yes dammit, I'm taking a picture. We're having a good time together! The fibreglass nose cone is finally going on so fabric will not be far off. When done it should be a smoothly flying glider.